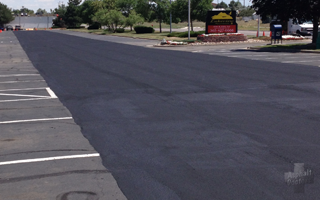 A coal tar emulsion sealer designed to protect and beautify asphalt pavement surfaces. It is designed to prevent gas, oil, and salt damage. It also prevents freeze/thaw damage by water seepage, sun-induced oxidation and reduces maintenance costs, Rubberized material enhances wear and adhesion, and prolongs pavement life. Coal tar emulsion will meet all Federal Government Specifications: RP-355e, FAA P25, MIL-C15203d and ASTM D3320. Sand, additives and water will be added in accordance with manufacturers recommended formulation and procedure. Manufacturer product data sheet is available upon request. A mineral reinforced, colloidally stabilized emulsion pavement sealer designed to protect and beautify asphalt pavement surfaces. This is accomplished by preventing gas, oil, and salt damage as well as preventing freeze/thaw damage by seepage. This also prevents suninduced oxidation, reduces maintenance costs. Rubberized material enhances wear and adhesion and prolongs the life of the pavement. Asphalt emulsion sealer will meet all Federal Government Specifications: TCC-5588, ASSHTO=T-44, ASTM D-217 and ASTM D-2939. Sand, additives and water will be added in accordance with manufacturer recommended formulation and procedure. Manufacturer product data sheet is available upon request. The pavement must be cured and in sound condition. All grease, oil and gasoline spots will be scraped and treated with oil spot primer. ( Note: if oil spot is severe, removal and replacement of the damaged asphalt may be required and is not considered to be part of the contract). Surface will be swept and blown clean off all loose material for proper adhesion. Two applications will be applied unless otherwise stated in the contract, All edging and/or around any obstacles will be hand applied with squeegee. First coat will be applied with 30 mesh sand to create a thicker coat. Second coat will be applied when the first coat is dry. Second coat will be sprayed on by a mechanical applicator to obtain an optimum sealcoat. 50 to 70 square feet per gallon for two coats depending on the age and condition of the pavement. Sealcoat should be allowed to dry 24 hours before permitting heavy traffic. (Note: When asphalt surface is cold or in the shade, or the air temperature is below 75 degrees, drying time may need to be extended.) Minimum application temperature is a ground temperature of 45 degrees and rising.